gravy, and that old reliable day-after-Thanksgiving staple, turkey fried rice. birds at Sun Wah BBQ, the neighborhood Beijing duck joint. the Thanksgiving table hadn’t necessarily taken root in the home. macaroni, and Jello -- what could be more American than that? gamblers at El Rancho Vegas. 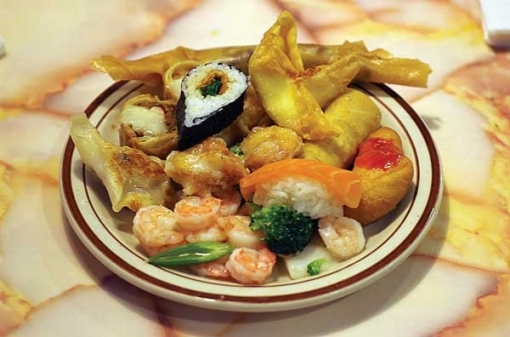 get...all-you-can-eat egg rolls? Freaking brilliant. local needs and tastes due to the flexibility of the open buffet layout. still intriguing differences in admission prices, food options, and clientele. up before the koi pond at the entrance. food was an important symbol of their Americanization." Thanksgiving. As one Asian American woman complains: “The clientele? Gypsys, Tramps, and Thieves. That is all that I will say. Image credit: Chris Busby at TheBollard.com. days a week at a rate of $3 an hour.